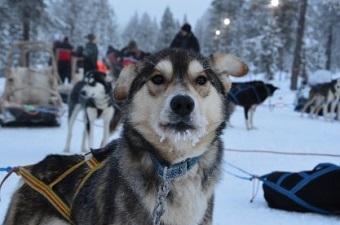 Be the driver of your very own team of Huskies, on our Husky Heaven adventure! 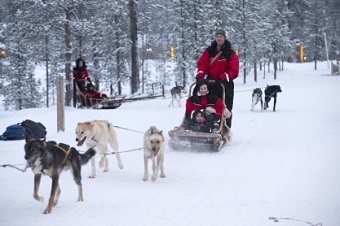 Start by taking a driving lesson from one of the husky farmers, as the accelerators of these sleighs are alive with energy! When you know your way around the sleigh and all your hand signals, you’re ready to meet your team. These fluffy, loveable, energetic dogs were born to run, and they show their excitement through barking… and lots of it! But don’t be alarmed by the loudness, it just shows you how ready they are. 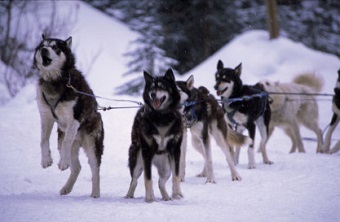 Once your passengers are cuddled up in the sleigh, and you are braced for action, you are set to go…. 3, 2, 1…and your off! Flying across the snow, at the speed of light, snow covered trees flashing past you. Curving and turning with just a lean of your body, leaving nothing but tracks in the snow behind you. Icy air whipping round your face, as you grip the handle, adrenalin coursing through your veins. As you twist and turn through the milky landscape, your team show their power, paws pounding across the ground. Barks and howls now silent as they run. They’re in their element. As you come to the end of your course, you’ll hear the sound of stillness rising, as the yelps and roars enter your ears once more. When you come to a stop, and have had your sleigh tied off, it’s now time for you to get up close and personal with your fluffy team. Learn their names from the husky farmers and find out who’s related to who!!! Cuddle and stroke your adoring dogs, as their big round eyes stare up at you with love. Take photographic memories of these gorgeous creatures that will last a lifetime, before saying good bye to continue with the adventure and magic of the day.